II.A second article on the Book of Maccabees is inserted as treating the subject from a Jewish standpoint.—J. There are four books which pass under this name—I, II, III, and IV Maccabees. The first of these is the only one of the four which can be regarded as a reliable historical source. I Maccabees: The First Book of the Maccabees covers the period of forty years from the accession of Antiochus (175 B.C.) to the death of Simon the Maccabee (135 B.C.). Its contents are as follows: Ch. i. 1-9 is a brief historical introduction; i. 10-ii. 70 treats of the rise of the Maccabean revolt; iii. 1-ix. 22 is devoted to the Maccabean struggle under Judas; ix. 23-xii. 53, to the fortunes of Israel under Jonathan; xiii. 1-xvi. 24, to the administration of Simon. The events are followed with intense interest and sympathy. At times the enthusiasm of the writer rises to a high pitch and breaks out into poetry of a genuine Semitic character (comp. iii. 3-9). The style is simple, terse, restrained, and objective, modeled throughout on that of the historical books of the Old Testament. The fact that just proportions are observed in treating the different parts of the narrative proves the author to have been a writer of considerable skill. He dates all events in terms of the Seleucid era. It is clear from the Semitic idioms which occur throughout the work that it was composed in a Semitic language (see, for example, ii. 40, iv. 2), and certain passages indicate with great clearness that the original language was Hebrew (see ii. 39, iii. 19). To this fact Origen and Jerome also bear testimony, though it is possible that the version or paraphrase known to them was Aramaic. The Hebrew original seems not to have borne the name "Maccabees," though it is not known what was its real designation. Eusebius ("Hist. Eccl." vi. 25) quotes Origen as authority for the name Σαρβηθ Σαβαναι, a name which has been explained in many different ways. For some of these see Grimm ("Das Erste Buch der Makkabäer," p. xvii.). Dalman ("Grammar," p. 6), whom Torrey (Cheyne and Black, "Encyc. Bibl.") follows, takes the name as a corruption of (= "Book of the Hasmoneans"). If this be the correct interpretation, an Aramaic translation of the book must have been made at an early time, and it was this translation which was known to Origen and Jerome—a view which does not seem improbable. Be this as it may, the Hebrew was translated very early into Greek, and the Greek only has survived. The Greek version seems to be a literal one, often preserving the Semitic, and sometimes even the Hebrew, idiom; but it is clear, and probably it is, on the whole, a satisfactory translation. It is transmitted in three uncial manuscripts of the Septuagint—the Codex Sinaiticus, the Codex Alexandrinus, and the Codex Venetus—as well as in several cursives. Concerning the author no information is obtainable beyond that which may be inferred from the book itself. He was a devout and patriotic Jew who lived and wrote in Palestine. This latter fact is proved by his intimate and exact geographical knowledge of the Holy Land (comp. iii. 24; vii. 19; ix. 2-4, 33, 34, 43; xii. 36-40; xiii. 22, 23; xvi. 5, 6) and by his lack of accurate knowledge of any of the foreign countries which he mentions. The author was also a loyal admirer of the Hasmonean family; he believed that to it Israel owed her deliverance and existence. He admired not only the military deeds of Judas (comp. v. 63), but also those of Jonathan (comp. x. 15-21) and Simon (comp. xiv. 4-15). The narrative is told not as though deliverance came by miracle, but as though it was due to the military genius of these men, exercised under the favoring guidance of God (i. 64, iii. 8). Curiously enough the word "God" does not appear in the work, nor does the word "Lord." The idea is not lacking, however, as in the Book of Esther, but is represented by "Heaven," or by the pronoun "He." The author was a deeply religious man in spite of this mannerism. He was very zealous for the Law and for the national religious institutions (see i. 11, 15, 43; ii. 20-22; iii. 21), for the Scriptures (i. 56, iii. 48), and for the Temple (i. 21, 39; iii. 43). It should be noted, also, that throughout the work the priesthood is represented in a favorable light. The renegade priests Jason and Menelaus are not mentioned—a fact in striking contrast with the treatment which the Second Book of the Maccabeesaccords them. From these facts Geiger conjectured that the author was a Sadducee, and most recent writers follow him in this opinion, although they consider him wrong in calling the First Book of the Maccabees a partizan document; its temperate and just tone certainly redeems it from such a stricture. The terminus a quo of the work is found in the fact that John Hyreanus I., who began to reign in 135 B.C., is mentioned at the close of the book (xvi. 21-24). As the Romans are throughout spoken of in terms of respect and friendliness, it is clear that the terminus ad quem must be sought at some time before the conquest of Jerusalem by Pompey in 63 B.C. As to whether the date can be more nearly determined scholars are not agreed. The determining fact is held by most to be the statement in xvi. 23, 24, that the "rest of the acts of John . . . are written in the chronicles of his high-priesthood." It is thought by many that this implies that John had died and that a sufficient time had elapsed since his death to permit the circulation of the chronicles. Bissell (Lange's "Commentary," p. 479) thinks that not more than a score or two of years had passed, while Schürer ("Hist. of the Jewish People," div. ii., vol. iii., p. 8) and Fairweather (in "Cambridge Bible" and Hastings, "Dict. Bible") think that not more than a decade or two had elapsed, and date the work in the first or second decade of the first century B.C. Torrey, on the other hand, thinks ("Encyc. Bibl.") that this reference to the chronicle of the priesthood is an imitation of well-known passages in the Books of Kings, that it was intended solely as a compliment to John, and that the work was composed early in his reign (i.e., soon after 135 B.C.) by one who had been an interested spectator of the whole Maccabean movement. The vivid character of the narrative and the fact that it closes so abruptly after the death of Simon make this a very plausible view. Those who maintain the later date of the work are obliged to account for the vivid details which it contains by supposing that the writer employed older sources, such as letters and memoranda. In Torrey's view no such sources are needed, as the author, where he did not have personal knowledge, could have talked with participants or eye-witnesses of the events. In either case the First Book of the Maccabees is one of the best sources known for the history of the Jews. 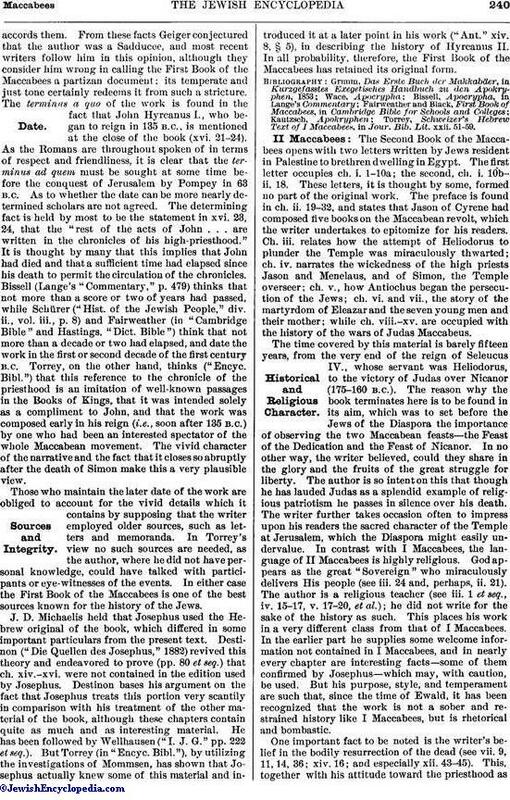 J. D. Michaelis held that Josephus used the Hebrew original of the book, which differed in some important particulars from the present text. Destinon ("Die Quellen des Josephus," 1882) revived this theory and endeavored to prove (pp. 80 et seq.) that ch. xiv.-xvi. were not contained in the edition used by Josephus. Destinon bases his argument on the fact that Josephus treats this portion very scantily in comparison with his treatment of the other material of the book, although these chapters contain quite as much and as interesting material. He has been followed by Wellhausen ("I. J. G." pp. 222 et seq.). But Torrey (in "Encyc. Bibl. "), by utilizing the investigations of Mommsen, has shown that Josephus actually knew some of this material and introduced it at a later point in his work ("Ant." xiv. 8, § 5), in describing the history of Hyrcanus II. In all probability, therefore, the First Book of the Maccabees has retained its original form. Kautzsch, Apokryphen; Torrey, Schweizer's Hebrew Text of I Maccabees, in Jour. Bib. Lit. xxii. 51-59. II Maccabees: The Second Book of the Maccabees opens with two letters written by Jews resident in Palestine to brethren dwelling in Egypt. The first letter occupies ch. i. 1-10a; the second, ch. i. 10b-ii. 18. These letters, it is thought by some, formed no part of the original work. The preface is found in ch. ii. 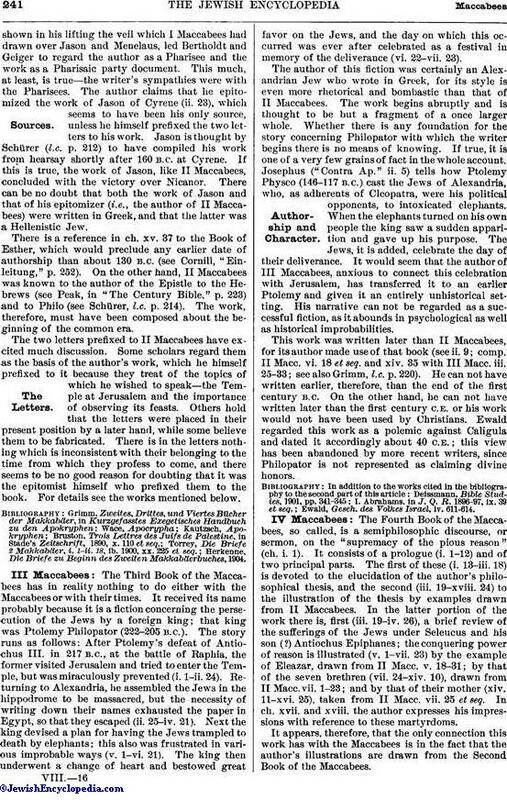 19-32, and states that Jason of Cyrene had composed five books on the Maccabean revolt, which the writer undertakes to epitomize for his readers. Ch. iii. relates how the attempt of Heliodorus to plunder the Temple was miraculously thwarted; ch. iv. narrates the wickedness of the high priests Jason and Menelaus, and of Simon, the Temple overseer; ch. v., how Antiochus began the persecution of the Jews; ch. vi. and vii., the story of the martyrdom of Eleazar and the seven young men and their mother; while ch. viii.-xv. are occupied with the history of the wars of Judas Maccabeus. The time covered by this material is barely fifteen years, from the very end of the reign of Seleucus IV., whose servant was Heliodorus, to the victory of Judas over Nicanor (175-160 B.C.). The reason why the book terminates here is to be found in its aim, which was to set before the Jews of the Diaspora the importance of observing the two Maccabean feasts—the Feast of the Dedication and the Feast of Nicanor. In no other way, the writer believed, could they share in the glory and the fruits of the great struggle for liberty. The author is so intent on this that though he has lauded Judas as a splendid example of religious patriotism he passes in silence over his death. The writer further takes occasion often to impress upon his readers the sacred character of the Temple at Jerusalem, which the Diaspora might easily undervalue. In contrast with I Maccabees, the language of II Maccabees is highly religious. God appears as the great "Sovereign" who miraculously delivers His people (see iii. 24 and, perhaps, ii. 21). The author is a religious teacher (see iii. 1 et seq., iv. 15-17, v. 17-20, et al. ); he did not write for the sake of the history as such. This places his work in a very different class from that of I Maccabees. In the earlier part he supplies some welcome information not contained in I Maccabees, and in nearly every chapter are interesting facts—some of them confirmed by Josephus—which may, with caution, be used. But his purpose, style, and temperament are such that, since the time of Ewald, it has been recognized that the work is not a sober and restrained history like I Maccabees, but is rhetorical and bombastic. One important fact to be noted is the writer's belief in the bodily resurrection of the dead (see vii. 9, 11, 14, 36; xiv. 16; and especially xii. 43-45). This, together with his attitude toward the priesthood asshown in his lifting the veil which I Maccabees had drawn over Jason and Menelaus, led Bertholdt and Geiger to regard the author as a Pharisee and the work as a Pharisaic party document. This much, at least, is true—the writer's sympathies were with the Pharisees. The author claims that he epitomized the work of Jason of Cyrene (ii. 23), which seems to have been his only source, unless he himself prefixed the two letters to his work. Jason is thought by Schürer (l.c. p. 212) to have compiled his work from hearsay shortly after 160 B.C. at Cyrene. If this is true, the work of Jason, like II Maccabees, concluded with the victory over Nicanor. There can be no doubt that both the work of Jason and that of his epitomizer (i.e., the author of II Maccabees) were written in Greek, and that the latter was a Hellenistic Jew. There is a reference in ch. xv. 37 to the Book of Esther, which would preclude any earlier date of authorship than about 130 B.C. (see Cornill, "Einleitung," p. 252). 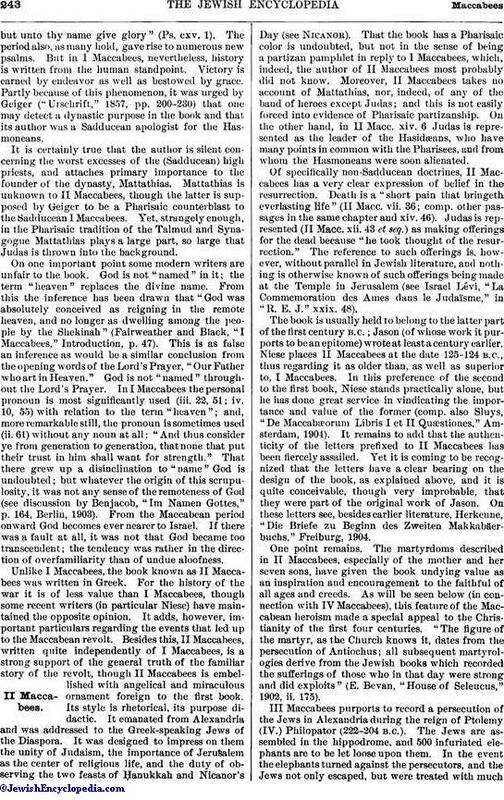 On the other hand, II Maccabees was known to the author of the Epistle to the Hebrews (see Peak, in "The Century Bible," p. 223) and to Philo (see Schürer, l.c. p. 214). The work, therefore, must have been composed about the beginning of the common era. The two letters prefixed to II Maccabees have excited much discussion. Some scholars regard them as the basis of the author's work, which he himself prefixed to it because they treat of the topics of which he wished to speak—the Temple at Jerusalem and the importance of observing its feasts. Others hold that the letters were placed in their present position by a later hand, while some believe them to be fabricated. There is in the letters nothing which is inconsistent with their belonging to the time from which they profess to come, and there seems to be no good reason for doubting that it was the epitomist himself who prefixed them to the book. For details see the works mentioned below. Herkenne, Die Briefe zu Beginn des Zweiten Makkabäerbuches, 1904. III Maccabees: The Third Book of the Maccabees has in reality nothing to do either with the Maccabees or with their times. It received its name probably because it is a fiction concerning the persecution of the Jews by a foreign king; that king was Ptolemy Philopator (222-205 B.C.). The story runs as follows: After Ptolemy's defeat of Antiochus III. in 217 B.C., at the battle of Raphia, the former visited Jerusalem and tried to enter the Temple, but was miraculously prevented (i. 1-ii. 24). Returning to Alexandria, he assembled the Jews in the hippodrome to be massacred, but the necessity of writing down their names exhausted the paper in Egypt, so that they escaped (ii. 25-iv. 21). Next the king devised a plan for having the Jews trampled to death by elephants; this also was frustrated in various improbable ways (v. 1-vi. 21). The king then underwent a change of heart and bestowed great favor on the Jews, and the day on which this occurred was ever after celebrated as a festival in memory of the deliverance (vi. 22-vii. 23). The author of this fiction was certainly an Alexandrian Jew who wrote in Greek, for its style is even more rhetorical and bombastic than that of II Maccabees. The work begins abruptly and is thought to be but a fragment of a once larger whole. Whether there is any foundation for the story concerning Philopator with which the writer begins there is no means of knowing. If true, it is one of a very few grains of fact in the whole account. Josephus ("Contra Ap." ii. 5) tells how Ptolemy Physco (146-117 B.C.) cast the Jews of Alexandria, who, as adherents of Cleopatra, were his political opponents, to intoxicated elephants. When the elephants turned on his own people the king saw a sudden apparition and gave up his purpose. The Jews, it is added, celebrate the day of their deliverance. It would seem that the author of III Maccabees, anxious to connect this celebration with Jerusalem, has transferred it to an earlier Ptolemy and given it an entirely unhistorical setting. His narrative can not be regarded as a successful fiction, as it abounds in psychological as well as historical improbabilities. This work was written later than II Maccabees, for its author made use of that book (see ii. 9; comp. II Macc. vi. 18 et seq. and xiv. 35 with III Macc. iii. 25-33; see also Grimm, l.c. p. 220). He can not have written earlier, therefore, than the end of the first century B.C. On the other hand, he can not have written later than the first century C.E. or his work would not have been used by Christians. Ewald regarded this work as a polemic against Caligula and dated it accordingly about 40 C.E. ; this view has been abandoned by more recent writers, since Philopator is not represented as claiming divine honors. Ewald, Gesch. des Volkes Israel, iv. 611-614. IV Maccabees: The Fourth Book of the Maccabees, so called, is a semiphilosophic discourse, or sermon, on the "supremacy of the pious reason" (ch. i. 1). It consists of a prologue (i. 1-12) and of two principal parts. The first of these (i. 13-iii. 18) is devoted to the elucidation of the author's philosophical thesis, and the second (iii. 19-xviii. 24) to the illustration of the thesis by examples drawn from II Maccabees. In the latter portion of the work there is, first (iii. 19-iv. 26), a brief review of the sufferings of the Jews under Seleucus and his son(?) Antiochus Epiphanes; the conquering power of reason is illustrated (v. 1-vii. 23) by the example of Eleazar, drawn from II Macc. v. 18-31; by that of the seven brethren (vii. 24-xiv. 10), drawn from II Macc. vii. 1-23; and by that of their mother (xiv. 11-xvi. 25), taken from II Macc. vii. 25 et seq. In ch. xvii. and xviii. the author expresses his impressions with reference to these martyrdoms.It appears, therefore, that the only connection this work has with the Maccabees is in the fact that the author's illustrations are drawn from the Second Book of the Maccabees. Ch. xviii. 3-24 has been thought by several scholars to be the work of a later hand, but the opinion does not appear to be well founded. Ch. xvii. 2 would form a weak ending to the book, while xviii. 20-24 suits well the style of the author of the earlier parts, and the apparent incongruity of xviii. 6-19 would seem to be designed in this hortatory composition to make a strong impression on its hearers. This latter view is strengthened if it be remembered that the work is throughout a discourse addressed directly to listeners (comp. i. 1, 7; ii. 13; xiii. 19; xviii. 1). 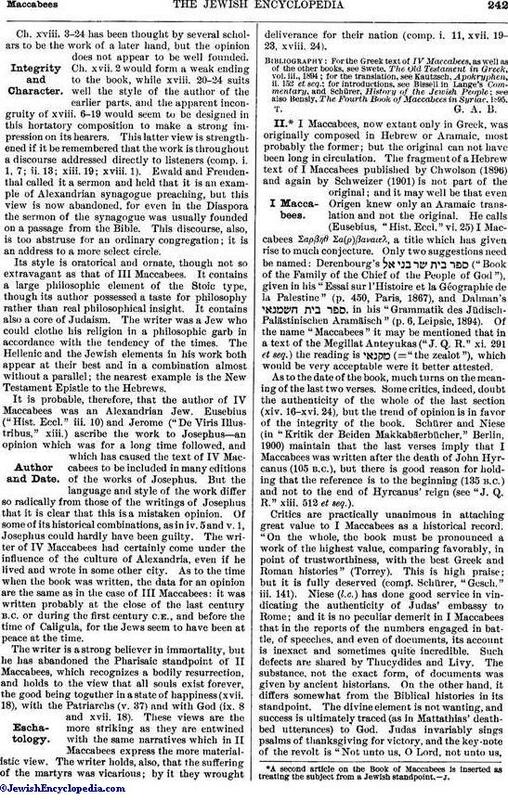 Ewald and Freudenthal called it a sermon and held that it is an example of Alexandrian synagogue preaching, but this view is now abandoned, for even in the Diaspora the sermon of the synagogue was usually founded on a passage from the Bible. This discourse, also, is too abstruse for an ordinary congregation; it is an address to a more select circle. Its style is oratorical and ornate, though not so extravagant as that of III Maccabees. It contains a large philosophic element of the Stoic type, though its author possessed a taste for philosophy rather than real philosophical insight. It contains also a core of Judaism. The writer was a Jew who could clothe his religion in a philosophic garb in accordance with the tendency of the times. The Hellenic and the Jewish elements in his work both appear at their best and in a combination almost without a parallel; the nearest example is the New Testament Epistle to the Hebrews. It is probable, therefore, that the author of IV Maccabees was an Alexandrian Jew. Eusebius ("Hist. Eccl." iii. 10) and Jerome ("De Viris Illustribus," xiii.) ascribe the work to Josephus—an opinion which was for a long time followed, and which has caused the text of IV Maccabees to be included in many editions of the works of Josephus. But the language and style of the work differ so radically from those of the writings of Josephus that it is clear that this is a mistaken opinion. Of some of its historical combinations, as in iv. 5 and v. 1, Josephus could hardly have been guilty. The writer of IV Maccabees had certainly come under the influence of the culture of Alexandria, even if he lived and wrote in some other city. As to the time when the book was written, the data for an opinion are the same as in the case of III Maccabees: it was written probably at the close of the last century B.C. or during the first century C.E., and before the time of Caligula, for the Jews seem to have been at peace at the time. The writer is a strong believer in immortality, but he has abandoned the Pharisaic standpoint of II Maccabees, which recognizes a bodily resurrection, and holds to the view that all souls exist forever, the good being together in a state of happiness (xvii. 18), with the Patriarchs (v. 37) and with God (ix. 8 and xvii. 18). These views are the more striking as they are entwined with the same narratives which in II Maccabees express the more materialistic view. The writer holds, also, that the suffering of the martyrs was vicarious; by it they wrought deliverance for their nation (comp. i. 11, xvii. 19-23, xviii. 24). see also Bensly, The Fourth Book of Maccabees in Syriac, 1895. T. G. A. B.II.A second article on the Book of Maccabees is inserted as treating the subject from a Jewish standpoint.—J. I Maccabees. I Maccabees, now extant only in Greek, was originally composed in Hebrew or Aramaic, most probably the former; but the original can not have been long in circulation. The fragment of a Hebrew text of I Maccabees published by Chwolson (1896) and again by Schweizer (1901) is not part of the original; and it may well be that even Origen knew only an Aramaic translation and not the original. He calls (Eusebius, "Hist. Eccl." vi. 25) I Maccabees Σαρβηθ Σα(ρ)βαναιελ, a title which has given rise to much conjecture. Only two suggestions need be named: Derenbourg's ("Book of the Family of the Chief of the People of God"), given in his "Essai sur l'Histoire et la Géographie de la Palestine" (p. 450, Paris, 1867), and Dalman's , in his "Grammatik des Jüdisch-Palästinischen Aramäisch" (p. 6, Leipsic, 1894). Of the name "Maccabees" it may be mentioned that in a text of the Megillat Anteyukas ("J. Q. R." xi. 291 et seq.) the reading is (= "the zealot"), which would be very acceptable were it better attested. As to the date of the book, much turns on the meaning of the last two verses. Some critics, indeed, doubt the authenticity of the whole of the last section (xiv. 16-xvi. 24), but the trend of opinion is in favor of the integrity of the book. Schürer and Niese (in "Kritik der Beiden Makkabäerbücher," Berlin, 1900) maintain that the last verses imply that I Maccabees was written after the death of John Hyrcanus (105 B.C. ), but there is good reason for holding that the reference is to the beginning (135 B.C.) and not to the end of Hyrcanus' reign (see "J. Q. R." xiii. 512 et seq.). Critics are practically unanimous in attaching great value to I Maccabees as a historical record. "On the whole, the book must be pronounced a work of the highest value, comparing favorably, in point of trustworthiness, with the best Greek and Roman histories" (Torrey). This is high praise; but it is fully deserved (comp. Schürer, "Gesch." iii. 141). Niese (l.c.) has done good service in vindicating the authenticity of Judas' embassy to Rome; and it is no peculiar demerit in I Maccabees that in the reports of the numbers engaged in battle, of speeches, and even of documents, its account is inexact and sometimes quite incredible. Such defects are shared by Thucydides and Livy. The substance, not the exact form, of documents was given by ancient historians. On the other hand, it differs somewhat from the Biblical histories in its standpoint. The divine element is not wanting, and success is ultimately traced (as in Mattathias' deathbed utterances) to God. Judas invariably sings psalms of thanksgiving for victory, and the key-note of the revolt is "Not unto us, O Lord, not unto us,but unto thy name give glory" (Ps. cxv. 1). The period also, as many hold, gave rise to numerous new psalms. But in I Maccabees, nevertheless, history is written from the human standpoint. Victory is earned by endeavor as well as bestowed by grace. Partly because of this phenomenon, it was urged by Geiger ("Urschrift," 1857, pp. 200-230) that one may detect a dynastic purpose in the book and that its author was a Sadducean apologist for the Hasmoneans. It is certainly true that the author is silent concerning the worst excesses of the (Sadducean) high priests, and attaches primary importance to the founder of the dynasty, Mattathias. Mattathias is unknown to II Maccabees, though the latter is supposed by Geiger to be a Pharisaic counterblast to the Sadducean I Maccabees. Yet, strangely enough, in the Pharisaic tradition of the Talmud and Synagogue Mattathias plays a large part, so large that Judas is thrown into the background. On one important point some modern writers are unfair to the book. God is not "named" in it; the term "heaven" replaces the divine name. From this the inference has been drawn that "God was absolutely conceived as reigning in the remote heaven, and no longer as dwelling among the people by the Shekinah" (Fairweather and Black, "I Maccabees," Introduction, p. 47). This is as false an inference as would be a similar conclusion from the opening words of the Lord's Prayer, "Our Father who art in Heaven." God is not "named" throughout the Lord's Prayer. In I Maccabees the personal pronoun is most significantly used (iii. 22, 51; iv. 10, 55) with relation to the term "heaven"; and, more remarkable still, the pronoun is sometimes used (ii. 61) without any noun at all: "And thus consider ye from generation to generation, that none that put their trust in him shall want for strength." That there grew up a disinclination to "name" God is undoubted; but whatever the origin of this scrupulosity, it was not any sense of the remoteness of God (see discussion by Benjacob, "Im Namen Gottes," p. 164, Berlin, 1903). From the Maccabean period onward God becomes ever nearer to Israel. If there was a fault at all, it was not that God became too transcendent; the tendency was rather in the direction of overfamiliarity than of undue aloofness. Unlike I Maccabees, the book known as II Maccabees was written in Greek. For the history of the war it is of less value than I Maccabees, though some recent writers (in particular Niese) have maintained the opposite opinion. It adds, however, important particulars regarding the events that led up to the Maccabean revolt. Besides this, II Maccabees, written quite independently of I Maccabees, is a strong support of the general truth of the familiar story of the revolt, though II Maccabees is embellished with angelical and miraculous ornament foreign to the first book. Its style is rhetorical, its purpose didactic. It emanated from Alexandria and was addressed to the Greek-speaking Jews of the Diaspora. It was designed to impress on them the unity of Judaism, the importance of Jerusalem as the center of religious life, and the duty of observing the two feasts of Ḥanukkah and Nicanor's Day (see Nicanor). That the book has a Pharisaic color is undoubted, but not in the sense of being a partizan pamphlet in reply to I Maccabees, which, indeed, the author of II Maccabees most probably did not know. Moreover, II Maccabees takes no account of Mattathias, nor, indeed, of any of the band of heroes except Judas; and this is not easily forced into evidence of Pharisaic partizanship. On the other hand, in II Macc. xiv. 6 Judas is represented as the leader of the Hasidtæans, who have many points in common with the Pharisees, and from whom the Hasmoneans were soon alienated. Of specifically non-Sadducean doctrines, II Maccabees has a very clear expression of belief in the resurrection. Death is a "short pain that bringeth everlasting life" (II Macc. vii. 36; comp. other passages in the same chapter and xiv. 46). Judas is represented (II Macc. xii. 43 et seq.) as making offerings for the dead because "he took thought of the resurrection." The reference to such offerings is, however, without parallel in Jewish literature, and nothing is otherwise known of such offerings being made at the Temple in Jerusalem (see Israel Lévi, "La Commemoration des Ames dans le Judaïsime," in "R. E. J." xxix. 48). The book is usually held to belong to the latter part of the first century B.C. ; Jason (of whose work it purports to be an epitome) wrote at least a century earlier. Niese places II Maccabees at the date 125-124 B.C., thus regarding it as older than, as well as superior to, I Maccabees. In this preference of the second to the first book, Niese stands practically alone, but he has done great service in vindicating the importance and value of the former (comp. also Sluys, "De Maccabæorum Libris I et II Quæstiones," Amsterdam, 1904). It remains to add that the authenticity of the letters prefixed to II Maccabees has been fiercely assailed. Yet it is coming to be recognized that the letters have a clear bearing on the design of the book, as explained above, and it is quite conceivable, though very improbable, that they were part of the original work of Jason. On these letters see, besides earlier literature, Herkenne, "Die Briefe zu Beginn des Zweiten Makkabäerbuchs," Freiburg, 1904. One point remains. The martyrdoms described in II Maccabees, especially of the mother and her seven sons, have given the book undying value as an inspiration and encouragement to the faithful of all ages and creeds. As will be seen below (in connection with IV Maccabees), this feature of the Maccabean heroism made a special appeal to the Christianity of the first four centuries. "The figure of the martyr, as the Church knows it, dates from the persecution of Antiochus; all subsequent martyrologies derive from the Jewish books which recorded the sufferings of those who in that day were strong and did exploits" (E. Bevan, "House of Seleucus," 1902, ii. 175). III Maccabees purports to record a persecution of the Jews in Alexandria during the reign of Ptolemy (IV.) Philopator (222-204 B.C.). The Jews are assembled in the hippodrome, and 500 infuriated elephants are to be let loose upon them. In the event the elephants turned against the persecutors, and the Jews not only escaped, but were treated with muchhonor by the king. That there is much of the fabulous in this story is obvious, and it may well be that the similar story told in Josephus ("Contra Ap." ii. 5) concerning Ptolemy (VII.) Physcon is, as most assume, the original of III Maccabees. The book would thus belong at the latest to the first century C.E. ; at the earliest to the last century B.C. Recently important new light has been thrown on the book by the discovery of early Jewish settlements in the Fayum. On independent gounds, the present writer ("J. Q. R." ix. 39) and Prof. A. Büchler ("Tobiaden und Oniaden," pp. 172 et seq., Vienna, 1899) have put forward the theory that the book refers to a persecution in the Fayum. Certainly, the rapid transference of Jewish allegiance from Egyptian to Syrian hegemony about 200 B.C. finds its explanation if the Jews of Egypt were then undergoing persecution. That the author was an Alexandrian is unquestionable. On the other hand, Willrich ("Hermes," 1904, xxxix. 244) disputes the Fayum theory and supports the view that the book is best explained as referring to Caligula. The beautiful work known as IV Maccabees is a homily, not a history. 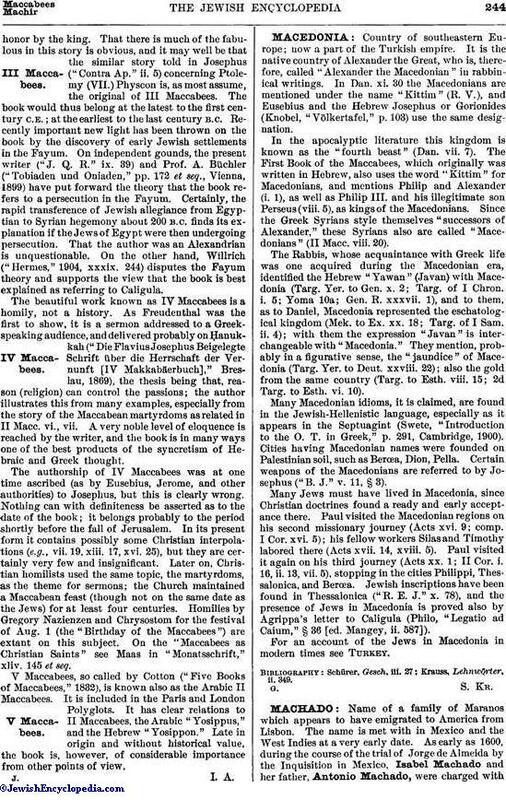 As Freudenthal was the first to show, it is a sermon addressed to a Greekspeaking audience, and delivered probably on Ḥanukkah ("Die Flavius Josephus Beigelegte Schrift über die Herrschaft der Vernunft [IV Makkabäerbuch]," Breslau, 1869), the thesis being that, reason (religion) can control the passions; the author illustrates this from many examples, especially from the story of the Maccabean martyrdoms as related in II Macc. vi., vii. A very noble level of eloquence is reached by the writer, and the book is in many ways one of the best products of the syncretism of Hebraic and Greek thought. The authorship of IV Maccabees was at one time ascribed (as by Eusebius, Jerome, and other authorities) to Josephus, but this is clearly wrong. Nothing can with definiteness be asserted as to the date of the book; it belongs probably to the period shortly before the fall of Jerusalem. In its present form it contains possibly some Christian interpolations (e.g., vii. 19, xiii. 17, xvi. 25), but they are certainly very few and insignificant. Later on, Christian homilists used the same topic, the martyrdoms, as the theme for sermons; the Church maintained a Maccabean feast (though not on the same date as the Jews) for at least four centuries. Homilies by Gregory Nazienzen and Chrysostom for the festival of Aug. 1 (the "Birthday of the Maccabees") are extant on this subject. On the "Maccabees as Christian Saints" see Maas in "Monatsschrift," xliv. 145 et seq. 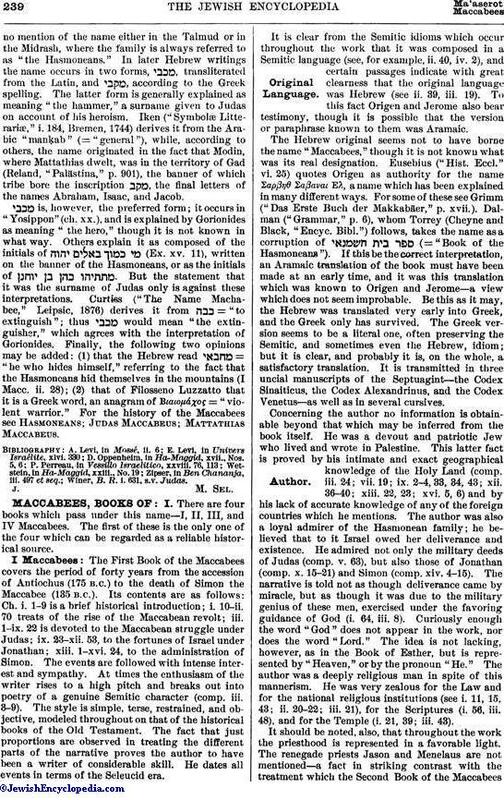 V Maccabees, so called by Cotton ("Five Books of Maccabees," 1832), is known also as the Arabic II Maccabees. It is included in the Paris and London Polyglots. It has clear relations to II Maccabees, the Arabic "Yosippus," and the Hebrew "Yosippon." Late in origin and without historical value, the book is, however, of considerable importance from other points of view.